Barbara Coll headed up moderator duties for this panel that includes familiar faces Bill Hunt of Global Strategies International and Marshall Simmonnds of the New York Times. It also includes Kara Jariwaia from Cisco. First up is Bill Hunt. Audience poll: How many of you are big brands? Over half. Bill mentions he’s seen this as a trend. IBM current results, 55 million pages in Google, 5,000 terms in top 5, search is 25% of all traffic, keyword research in all marketing. Search as we know it (meta tag edits) is over. Times are changing. Multiple people are attending conferences, many brands are hiring in-house search marketers. New product launches make search critical. Search is being integrated into all marketing on a global level. 4. Phase IV: Search is integrated globally with support for OEM partners. Search is mission critical to the business. Opportunity matirx – estimate what opportunity there is if you engage a search campaign. Use this to sell the idea of a search campaign and to motivate managers. Importance of understanding intent – In addition to ranking, the percent of demand depends on how well you pages match searchers intent. Paying attention to this can mean incremental increases in conversions and sales. Semantic mapping of keywords – Segmenting and profiling of searchers based on intent and position is the “Decision to research cycle” is critical to a richer experience. Many brands use language that is not indicative of what people search on. Update the styleguide to be search engine friendly and the effect can be site wide. Use a “Search Health Report”. Monitor on an ongoing basis to indentify possible issues. Next up is Marshall Simmonds who works with New York Tiumes that also owns About.com, International Herald Tribune and the Boston Globe. 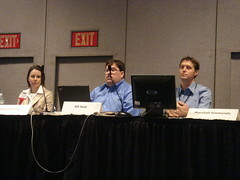 When About.com was acquired, one of the first steps was education about search. 1. Organize. Reach out to individuals as point people at each company. Engaged a team of marketing, technology, research, editorial and sales. 2. Analyze. Found out where the low hanging fruit was to show what kind of impact search can have. Got control over the templates, cleaned up code, global search/replace, fixed redirects and Title tag naming. 3. Education. This is an ongoing process with editorial staff and content producers. With About.com the goal was that anything coming “out of the shoot”, it would be optimized. The New York Times presented a host of other issues. Provide ongoing on education so the company understands search and to integrate it at the root level. Training was customized by department according to how that department’s activities would affect search. 4. Execute strategy and measure results. Metrics are critical starting with baseline measurement and including projections as well as causes of variations such as seasonality. 5. Track your results. Quantify your actions. Get buy-in from IT. Last up is Kara Jariwaia, a search marketing strategist from Cisco..
Kara talks about the challenges faced by Cisco: internal demand, word competition and leveraging partner networks. Cisco has over 80,000 web pages with 5,000 products. Embrace internal demand: Obstacles include large product portfolio, frequent product launches, local and global audience. Solutions include prioritized goals, global implementation, SEO training, keyword research and consult with external consultants. Managing word competition. Example, “VoIP”. MarCom, Tech support, Product Team. How to figure out which group gets the SEO resources for this phrase? It depends on what the customer is expecting. Also groups keywords into tiers: tier one, tier two, etc. Equalize your partner network. Current links showed most going to Cisco home page. Implemented an action to ask partners to link to more relevant internal pages. Focus on the most influential (in terms of page rank and authority) partners for links. How do you motivate the partner to change the way they link? Train partners on the value of search. Helping a partner rank well, it helps take up “shelf space” in the search results. Recommendations: Build a search strategy, centralize your search efforts, coordinate a cohesive link program.